I’ve just come to realise that the whole time that I was in China, I seemed to be eating meat 3 times a day. I usually only eat meat occasionally. However, as I think back, every meal seemed to have some sort of meat involved in some way. Even breakfast. I never eat meat for breakfast! But over in China the wantons in the soup or the steamed buns all seemed to have a little bit of meat in them. I must say that I enjoyed it immensely too. The food was great. I didn’t go out of my way to eat meat at every meal, it just seemed to be the way that it was. I just went along with what was on the table. 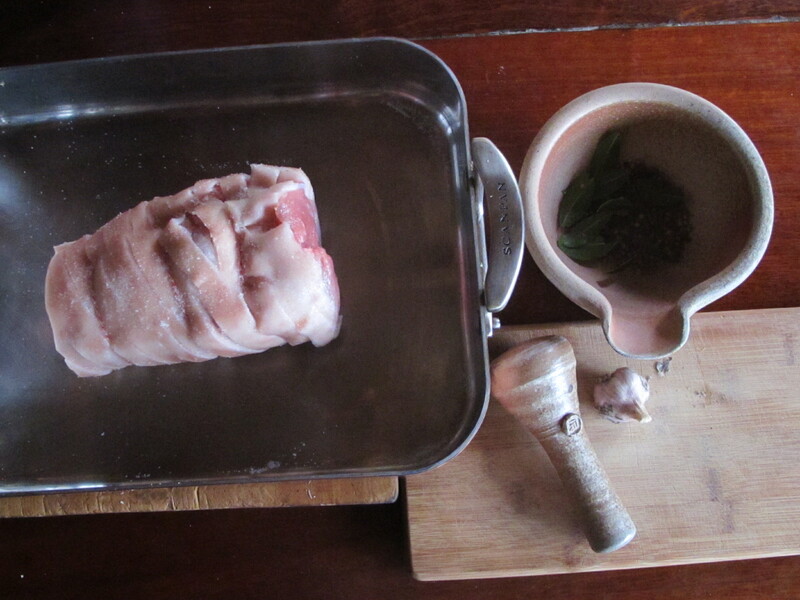 Now I’ve been home for a moth I decide to have a leg of pork for dinner. I get it boned, rolled and tied by the butcher. He also scores the skin for me. It takes a very sharp blade to do this and he is used to it, so I let him do it. I only tried once and was surprised how tough it was. none of my knives in the kitchen are kept in such a sharp condition, especially at the tip. 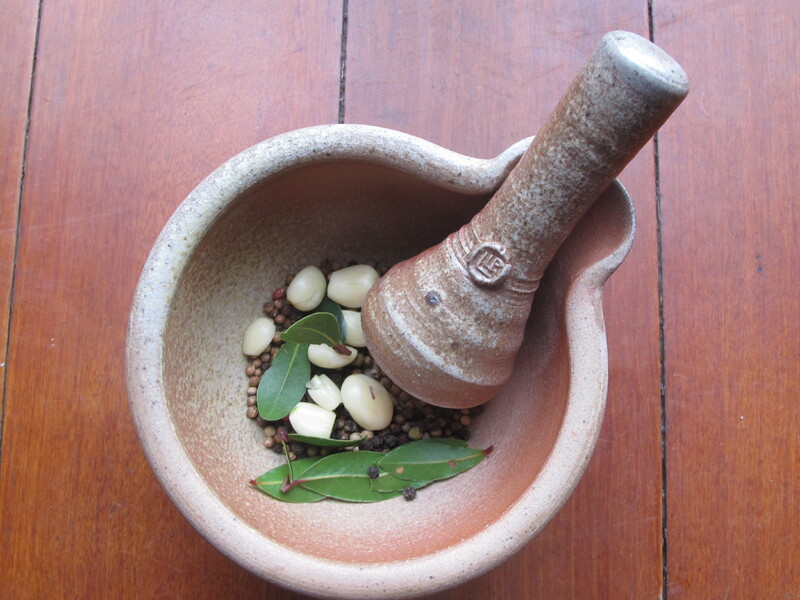 I make up a paste of garlic, bay leaves, pepper, some coriander seeds and a little salt. I pound all this together in one of our home made , wood fired, hand thrown mortar and pestles and crush it and grind it into a sort of paste. 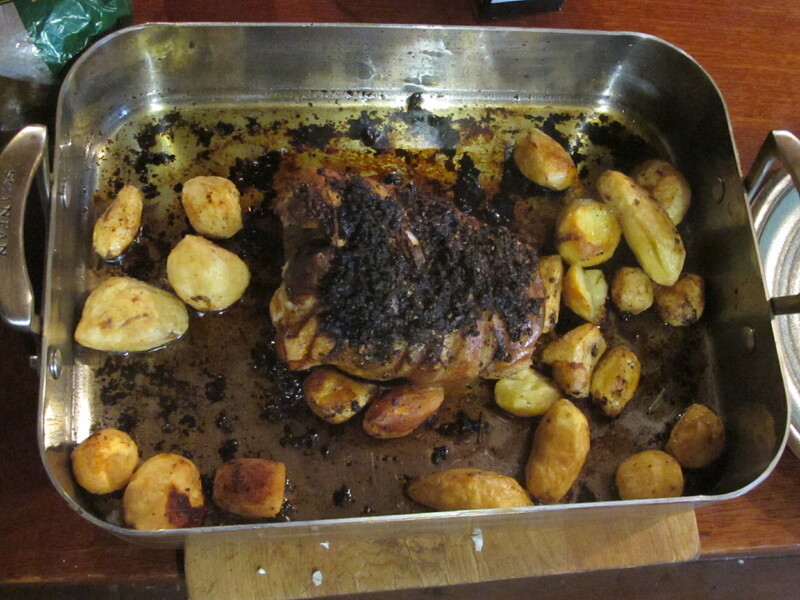 It needs a little bit of olive oil to get it to all flow in together. This paste is used to smear over the surface of the rolled roast before baking. It goes into a slow over for a very long time. 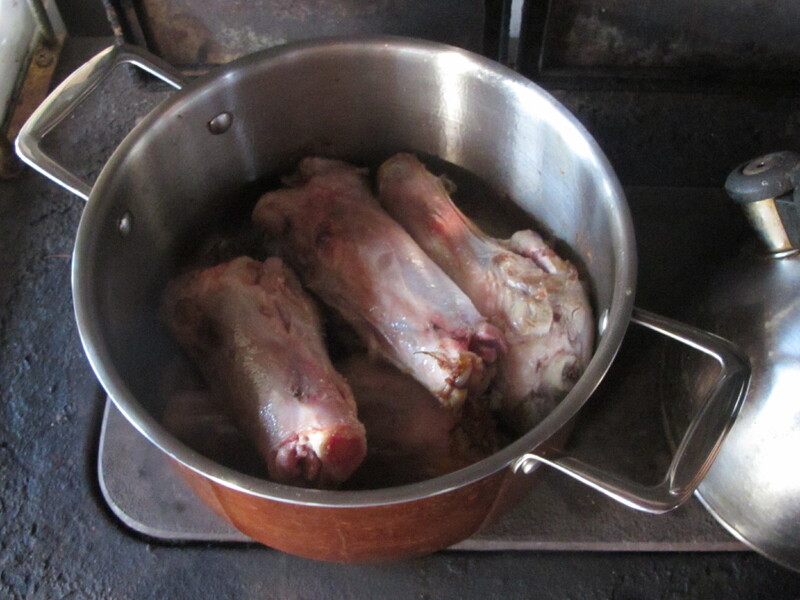 It stays cooking slowly for a few hours in the wood stove. As we are out working all day in the pottery, kiln shed, wood shed and garden. There are always more jobs to get done than there is time to do them. So we do what we can and let the rest just migrate to the bottom of the list and then fall off the end almost without noticing. But I do notice. I should just let them go, in true Buddhist style, but their ghost just lingers on in the back of my mind, as I sum up the day and try to let it all fade away with my out-breath, I “press the recline buttons down with dreamland coming on”. Of all the various activities that go into making up a life, most are just mundane, some tedious, lots repetitive, but it’s those few moments that are special that give a little sense of satisfaction, an achievement, that I remember. They are the glue that holds it all together. 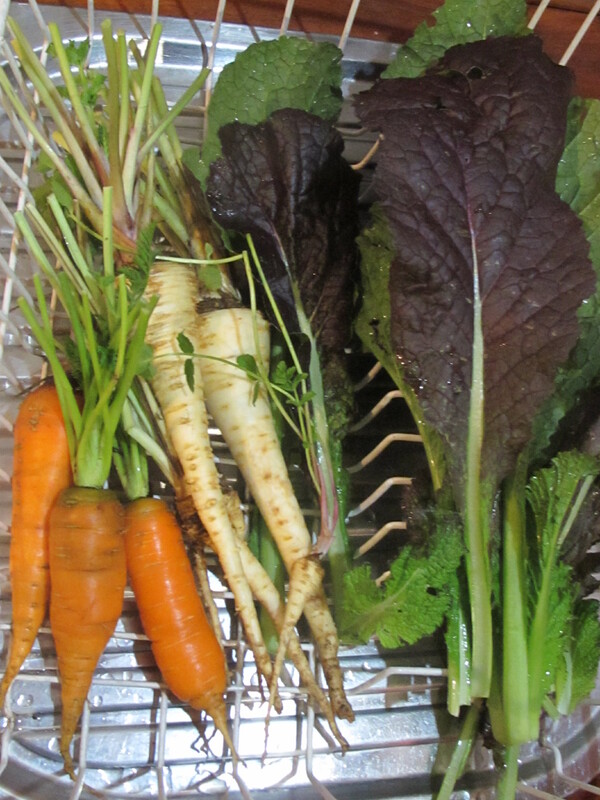 Picking fresh vegetables from the garden for a dinner like this is nothing special, we’ve done it almost everyday for 40 years, but it is always a pleasure and it is part of todays glue. We are getting frosts most mornings these days. Only light frost, perhaps -1oC, I don’t know, but it is enough to kill everything that is sensitive, but not not so cold as to make its way down to the ‘Pantry Field’ garden. Down there in that secluded spot, where there is plenty of tree cover, we have a small plot of 60 sq. 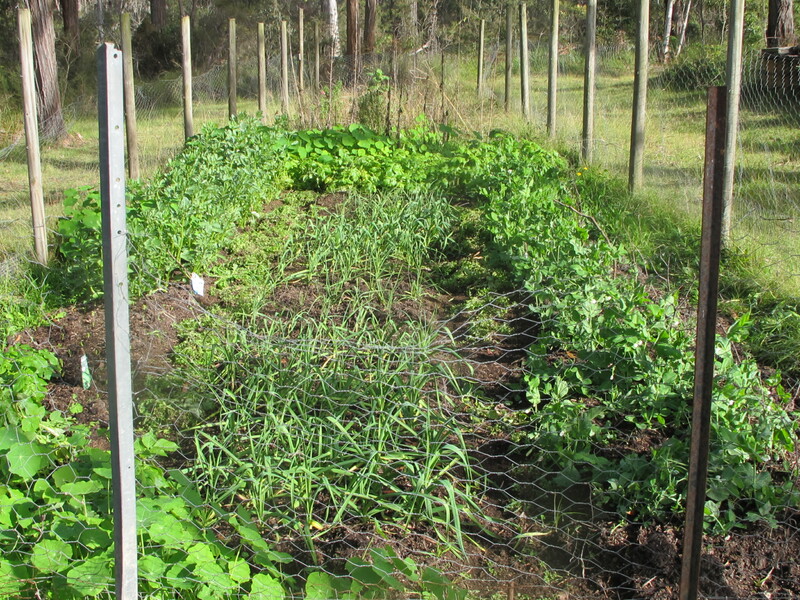 metres of fenced off garden, where we have found that we can grow a lot of frost sensitive plants , like over-winter potatoes and they are doing well, even the nasturtiums are still blooming. I found some time, just before a wood fired raku workshop, to get down there and do some more weeding, so as to give the plants a chance. The weeds grow so quickly! 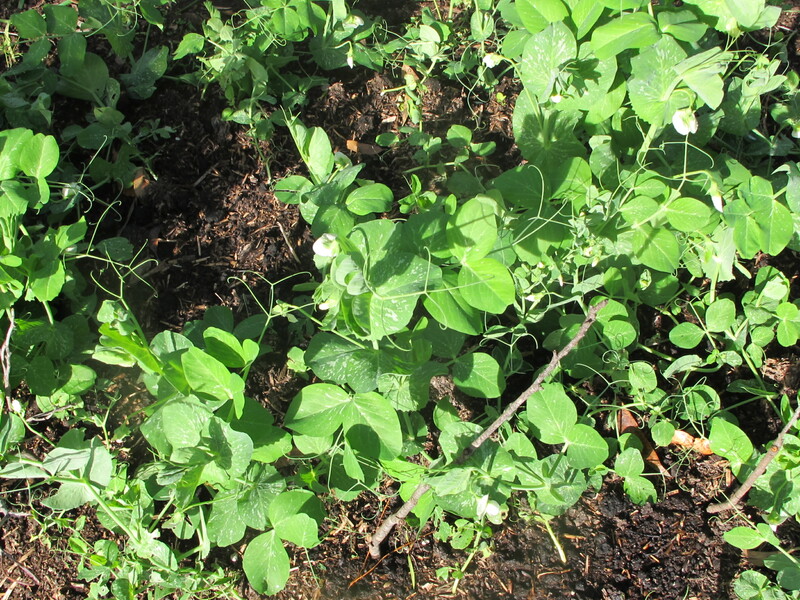 The peas are flowering now and so are the broad beans. I think that we will soon get a feed of peas from these plants. 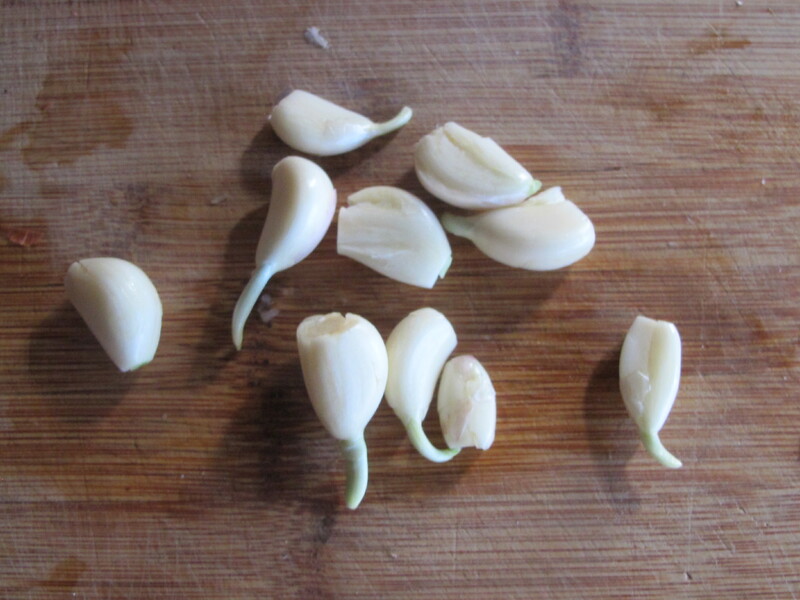 The garlic is very varied, some plants are surging ahead, while others have stayed quite small. Perhaps this is their individual habits. I have planted seven new varieties of ‘seed’ garlic this year. All down in the pantry field, where we haven’t ever grown garlic previously. fresh varieties in fresh soil. The last two plaits of garlic hanging in the kitchen ceiling are now a bit withered and starting to ‘shoot’ , but still have a good garlic flavour. They aren’t so juicy any more. I guess that it is because the weather is cold and the days short. 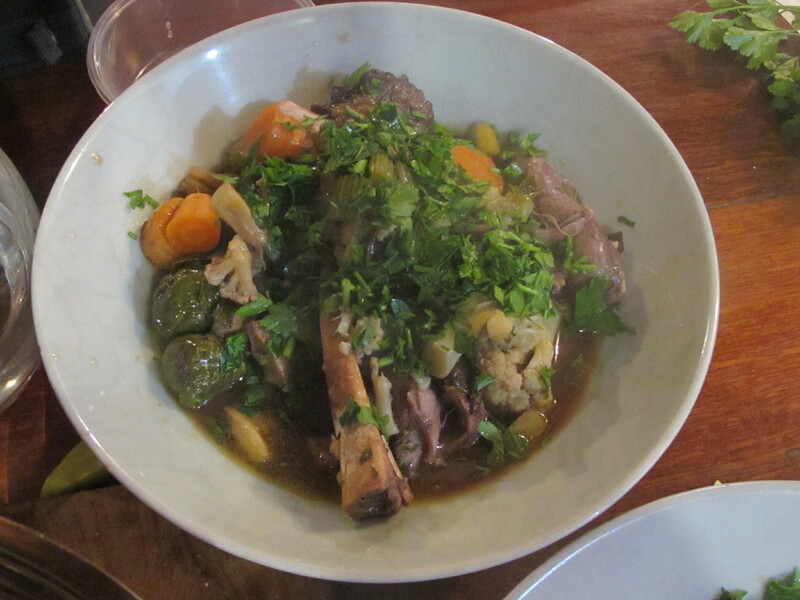 I seem to want to eat more meat these few weeks, so I buy a few lamb shanks and make a nice rich sauce for them to simmer in. 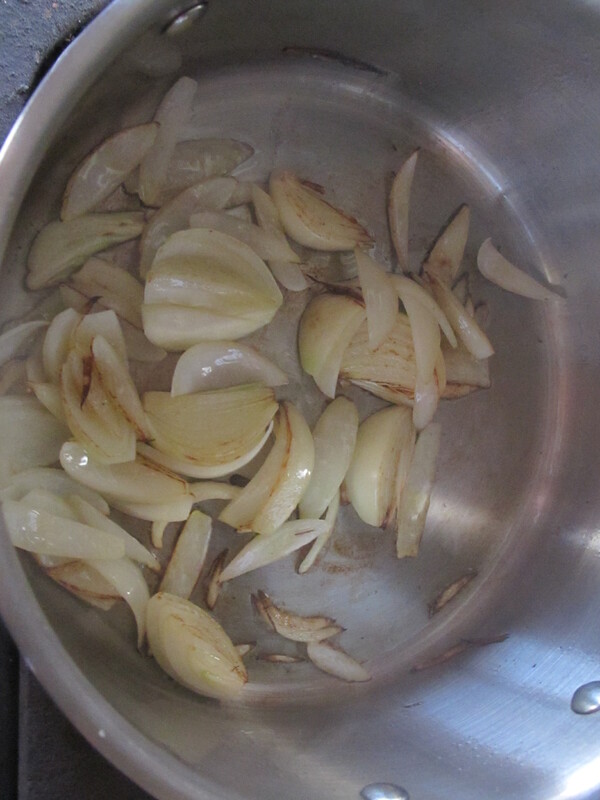 Brown onions in olive oil, a whole knob of our garlic and lots of herbs from the garden. 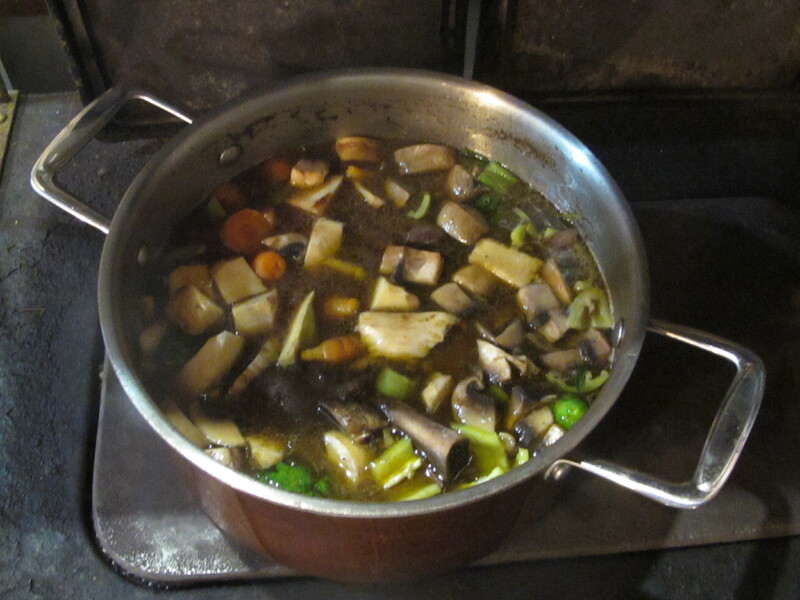 I brown the shanks and then add a whole bottle of merlot and let it simmer very slowly over a low fire for a couple of hours with half a tub of my marrow bone stock concentrate. When we come back into the kitchen in the evening dusk. I open the door into the kitchen and the room immerses me, seduces me, envelops me, in a blanket of warmth and flavoursome aromas. Such a wonderful, warm, welcoming greeting. the light is fading. the wind is picking up, the temperature is falling, but we are warm and secure in here, in our own self-reliant environment. 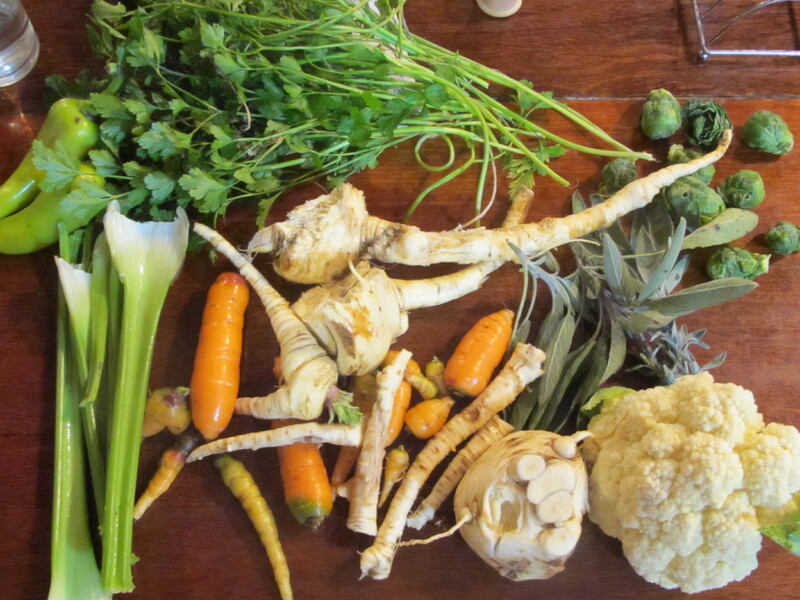 I add the fresh picked vegetables that we have brought in from the garden and let them mellow in to the stock, while we discuss the day and plan for tomorrow. I open a nice bottle of red wine and serve. Fantastic! Cold weather outside? Who cares! Roll on, the winter.